His name is Castle Crenshaw, but he calls himself Ghost. He’s been running ever since his drunk father came after him and his mother with a gun, aiming to kill, in the book, “Ghost” (Atheneum 2016), by Jason Reynolds. 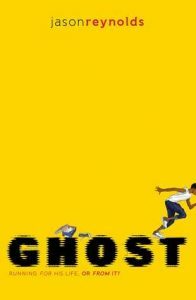 So now Ghost lives with his mom, his dad’s in jail, and Ghost is running from himself, getting into trouble at school until his crazy fast running takes him through the track field where Coach spots him. Coach has a passion for helping troubled kids who have track talent. He was an Olympic Medalist, himself, until he screwed up by taking drugs. He doesn’t want this to happen to Lu, Patina, Sunny. Or Ghost. All these kids are troubled. All are terrific characters—both male and female—on this city team. The characters are authentic. The story is authentic. This book really needs to be put in the hands of thousands of young readers. Whereas Ghost is a middle school student, older kids will enjoy this gritty, emotionally honest book. And it’s a fast read at only 180 pages. It’s already a best seller, was a finalist for the National Book Award, and just won the 2017 Charlotte Huck Award from the National Council of Teachers of English (NCTE). Reynolds is the man of the moment, an African American man writing from in his culture. And he’s doing that so well.